You’ve finished painting, so now it’s time to clean the alkyd paint from paintbrushes. 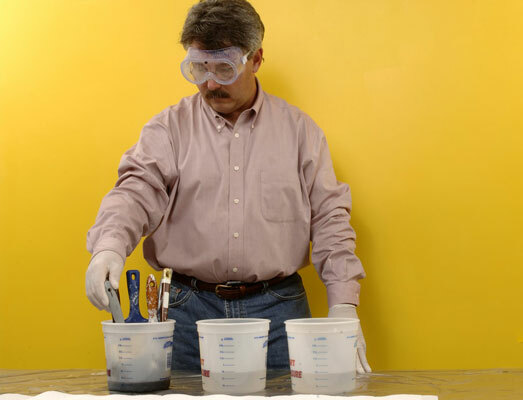 Use solvent (paint thinner) to clean alkyd paint from paintbrushes; soap and water won’t work. Cleaning paintbrushes before the paint has a chance to dry on them is the best way to keep your equipment in good shape. Cleaning with paint thinner can be quite messy. Work in a garage or outdoors, if you can. Be sure that wherever you choose is protected from splatters and is well ventilated. You need a wire paint comb, used paintbrush, paint container, latex gloves, goggles, dropcloths or newspapers, three plastic or metal containers (such as coffee cans), paint thinner or mineral spirits, paper towels, large cardboard box, large garbage bag (lawn-cleanup size). 2Protect yourself and the work area. 3Half fill each of the three containers with paint thinner. 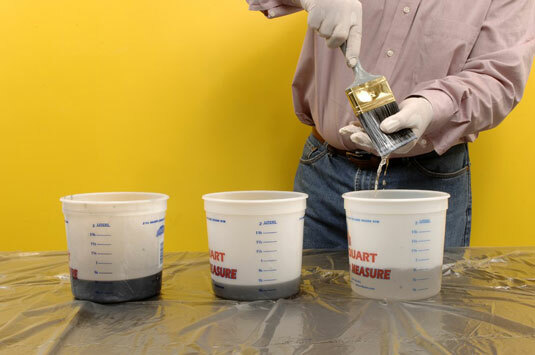 Set the three containers on the protected surface, and fill each half full with paint thinner. 4Comb out excess paint from the brush. Use the wire paint comb to scrape excess paint off the brush and into the paint can. 5Set the brushes in the first container of paint thinner. Put all your brushes into the first container and soak for five minutes. Wiggle them around to work out the paint. 6Create a place to blot the brushes with paper towels. 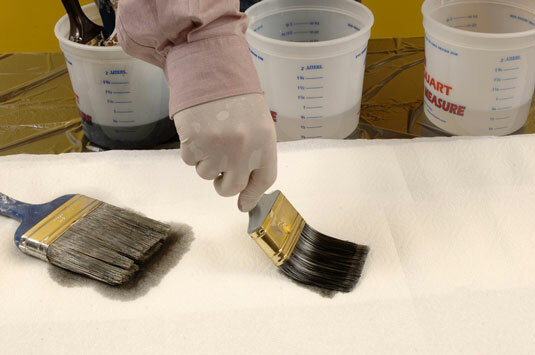 While the brushes are soaking, prepare a blotting area: Lay down several layers of paper towels on top of the protected surface where you’re working. 7Blot the brushes against the paper towels. Remove the brushes and place them on the paper towels. Use gentle pressure to press the bristles into the paper towels, blotting off the thinner. 8Repeat Steps 5 and 7 using the second container. 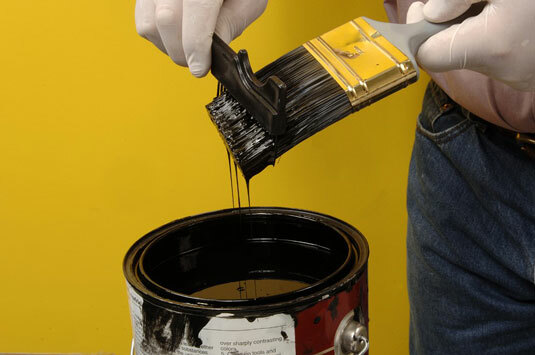 With each successive container more paint should come off the brushes. 9Rinse the brushes in the third container. Put the brushes into the third container and soak for three minutes. Swish them around once or twice. The liquid should be clean. 10Create a drying box for the brushes. 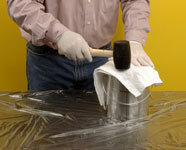 Create a place for the brushes to dry by lining a large cardboard box with a large garbage bag. 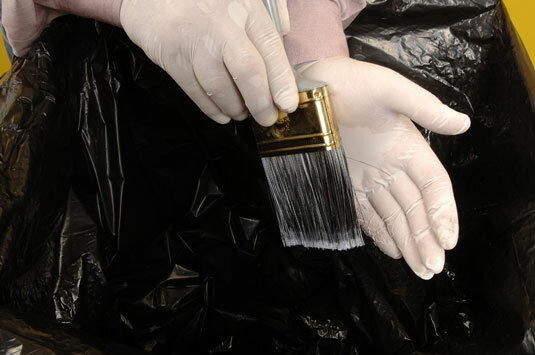 Pick up each brush and, using your gloved hand, squeeze the excess paint thinner back into the container. Blot the brushes on clean paper towels. No paint should appear on the paper towels at this point, all having been removed from the brushes. If paint still appears, go back to the second container and begin again from there. 12Beat the brush to remove residual paint thinner. Place your hands inside the large cardboard box to contain the spatter, and slap the metal heel of the brush handle against the heel of your hand repeatedly until no liquid is left. Dry with paper towels. 13Dispose of the paint thinner. Pour all the paint thinner into a single can. Replace the lid securely. Contact your local waste disposal service to ensure proper disposal.